It’s amazing how time and space can be transformed when you’re in the desert. One hour of silence and solitude during Eucharistic Adoration in the real presence of Jesus can transport you into the mysteries of Christ’s life. Yesterday, as I knelt before the Blessed Sacrament during my Holy hour, I found myself not alone, but alone with Christ. It was so quiet in the chapel that I could almost hear the flicker of the flame burning in the candle to the right of the tabernacle. Yet, I was listening to the voice of Jesus. As I knelt on the rocky ground, I could feel the gravel digging into my knee caps. Before me, Jesus was hanging from the cross, struggling for every breath. I felt helpless and ashamed of my cowardice. To rise up and object would certainly mean my death from the Roman soldier standing nearby. “How can I ever repay You?, I pleaded, choking on my words. The pain from the gravel beneath my knees grew worse and I blinked. I lost His gaze and He was gone. I found myself back in the Adoration Chapel kneeling on the soft cushion of the prie-dieu with the monstrance before me. My hour was almost over. The pain in my knees was just the arthritis from growing older. God continues to work in my life! 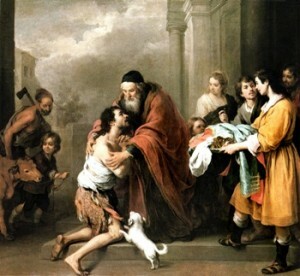 And, after reading today’s Gospel, Mark 1:21-28, about Jesus casting out the unclean spirit from the man in the synagogue; and yesterday’s Gospel, Mark 4:35-41, about the Apostles’ lack of faith while in their boat during the storm, I feel compelled to tell you how He recently touched me and helped my faith grow deeper. My wife and I had a wonderful but busy Christmas season. We traveled to Europe to visit our daughter who was studying abroad, and we toured parts of Belgium, France and Germany. We returned home on the 31st and caught up on a few necessary items before driving to Kansas City on Friday the 5th for our grandson Jack’s third birthday. Then, on Monday, I went on to my second in-residence week of training (also in Kansas City) to become a spiritual mentor. To say that I had been looking forward to this week would be an understatement. I was dying to get there and experience another week of God’s peace and the joy that radiates from the Sisters of the Apostles of the Interior Life (AVI). Don’t get me wrong, I truly loved spending quality time with my wife and daughter over the holiday, but with all the traveling and site-seeing I let my daily routine of meditative prayer slide. And, I dearly missed it. I was so looking forward to getting back on track, to the spiritual formation and the times of silence and solitude in the coming week. When I checked in I immediately felt a sense of belonging. The Sisters of the AVI and alumni mentors were there to meet me and the other students with whom I had become friends during our first session last May. We soon went to mass, had dinner, and had our first classroom session. By bedtime I was ready to pack my bags, get in my truck and go home. In a matter of a few hours everything about me transformed from being on fire to being consumed with doubt in my ability to ever succeed as a mentor, and a total sense of unworthiness to be there amid so many holy people. I hurt. I laid in bed begging Jesus for direction on what I needed to do to shake the fear. I was confused and worried. I knew I needed to trust in Him but I just couldn’t make myself let go. I awoke the next morning in worse condition than when I fell asleep. I prayed but still didn’t know what to do. I began my daily meditation by reading the scripture for the day. The Gospel for that morning, January 9th, was Mark 1:21-28 (the same passage as today). When I read about Jesus casting out the demon from the man, I was reminded of the spiritual warfare I had last year that made me fearful of posting on my blog. It was deja vu all over again! I thought, “Okay, been there and done that”, so I changed my prayer from, “Jesus, help me figure this out!”, to, “Jesus, I trust in You!” I prayed for the grace to truly turn it over to Him. But, no matter how hard I tried, I couldn’t do it. It wasn’t happening. I knew God was talking to me and I was meant to hear those words even if I understood nothing else. I knew something was going to happen while “in the Desert”, but I didn’t know what. Feeling ashamed of my failure to put all my faith in Jesus, I felt compelled to go to reconciliation as soon as the meditation was over. I confessed to Fr. Steve that my prayer life had been naught over the prior three weeks and I desperately wanted to get it back. I explained my feeling of unworthiness to be there and confessed that I simply couldn’t find a way to turn it over and totally trust in Jesus. Kindly, he told me there isn’t a day goes by during which he doesn’t feel unworthy to be a priest but he knows God called him to be one. And, he told me he knows God called me to be there and to be in the program. Christ, working through Fr. Steve’s hands, forgave me for my unbelief. I left the confessional and said my one Our Father for my penance. I knelt on the tile floor before Jesus in the Blessed Sacrament and I started to say, “Jesus, I trust in You.” But, before I uttered the first syllable, I felt an overwhelming rush of consuming love wash over me. If I hadn’t already been on both knees, I would have collapsed to them. In that instant of giving my heart and fear to Him, I felt and heard Him say, “Don’t be afraid, I’ve got this! You’re my beloved.” I broke into tears. From that moment, the rest of the week was perfect! I couldn’t have asked for more. I know I’ve shared many stories over the last five years about how God has worked in my life. But, folks, He is with us and is just waiting for us to open our minds to the truth, our hearts to His love, and our eyes to see the tangible signs of his presence in everything around us. I’m nobody special. You can find Him in your life, too. Yesterday was the day. I turned in my cell phone, computer and keys and I retired. Officially retired. Or, as some say, I started my permanent vacation. Although I’ve actually been on vacation and have not worked for six weeks, Monday will be the first day I haven’t been on my employer’s payroll in almost 36 years. I didn’t look back as I drove out the gate. Instead, I was looking forward to my next stop which was to church for my regularly scheduled hour of Eucharistic Adoration. As I knelt in prayer giving God thanks for the moment and for a long and prosperous career, I willingly laid to rest a life which I no longer enjoyed. I put to stern the stress of my professional responsibilities that had grown to more than I was willing to let my health absorb. I moved the memories of years of travel and separation from my family to my rearview mirror. As I waved goodbye to a life with which I could no longer identify, I programed my GPS with an address of a new life in which I will have time to devote to better health and building more intimate relationships with not just my family and friends, but with Jesus. Pulling myself away from those thoughts and back to the purpose at hand, of contemplating the life of Christ, I remembered that since it is the Easter Season my intention for the hour was to meditate on Christ’s resurrection by going back and reading those accounts from the Gospels. I started with Mark chapter 16 and I pondered the fear and wonder the women experienced when they found Jesus’ body missing but found a ‘young man’ instead who told them to not be amazed. I thought about the confusion and excitement they probably experienced when they were told to, “Go and tell his disciples and Peter, ‘He is going before you to Galilee; there you will see him, as he told you.’” (Mk 16:7) I wondered what I would have thought had I been in their shoes. I couldn’t imagine what might have been going through the minds of the Eleven. How could they process that Jesus had died but was living right before their eyes? I don’t know how they could fully understand but their strong faith at least allowed them to accept it and believe it. We have proof in the Acts of the Apostles that they did eventually connect the dots and make sense of everything that happened. Thinking some more about Jesus meeting the Apostles in Galilee, I realized He had planned all along to meet with them upon His resurrection. In fact, it was absolutely essential that He meet them so that they would believe and continue to follow Him and carry out His will of spreading the Good News. The only way He could do that was by defeating death and crossing over into a new life in which He could, indeed, be with them always until the end of the age. Then I remembered that Jesus didn’t just die for the Apostles, He died for you and me and all of humanity to save us from ourselves. It isn’t just the Apostles with whom He will be until the end of the age. It’s us, too. He crossed over into a new life so that He could have an intimate relationship with me. I’m feeling pretty good right now about the reasons behind my decision to retire! It’s four o’clock on Friday afternoon as I take my place on the prie-dieu, kneeling in front of the Tabernacle in the Blessed Sacrament Chapel for my hour of Adoration. 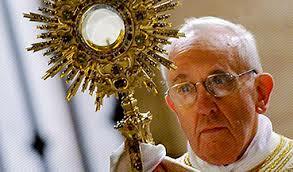 Today the Blessed Sacrament is exposed and Jesus is at home in the monstrance. It’s just me and Jesus here together. It doesn’t get much better than this. I say my prayers, giving thanks for His Grace and Mercy. I ask Him to forgive me for my sins and I ask for His blessings on my family. I give Him thanks for this opportunity to be here with Him. I pray that during the next hour, in the quiet solitude of this beautiful church, He makes Himself present to me. I look up at Him and I know He’s looking down at me, and my deepest desire is to feel His presence. As always, I tell myself to clear my mind so I can hear Him if He speaks to me. I try this almost every week and I know how difficult it is to lasso the stray thoughts and images and corral them into an out of the way corner. I am seldom successful. I tell myself, “Relax, take a deep breath, and picture Jesus looking back at you.” It strikes me that I’m thinking/talking to myself in the second person. I realize this conversation is anything but clearing my mind. I try again. After a few moments of nothingness….“Ugh, I forgot to get back with the Boss about those plans for next week. He’s not gonna be happy!” I catch myself before I go too far down this rabbit trail and I try to get back on track. Again, I utter, “Breathe, clear your mind. Look up at Jesus and feel Him looking down at you.” After another few moments of nothingness…. “Jesus, what do you see? What do you see when you look down at me? Besides a middle-aged, over-weight man with a growing bald spot on the top of his head, what do You see, Lord? What do You see in my heart? “Am I the disciple You would have me be? Do I do all that I can to bring others to You? Am I quick to be charitable? I try, Lord, but am I doing enough? Do my actions speak for themselves? Is my faith strong enough for me to be believable to others? Lord, I know I have made little effort lately to grow my faith, please help me. “What do You see, Lord? Am I the husband I should be to my wife? You know how much I love her, but do I make her feel as loved as she deserves to feel? Do I sacrifice and die to myself daily like I should for her? I know the answer. Please help me be a better husband. “What do You see in me as a parent? When You look into my daughters’ hearts do You see love that is borne from my love for them? Does my love reach across the miles to them? Have I been, and do I continue to be, a good role model for them? Perhaps so – they have chosen fine men to be their husbands – but, please, show me how to continue. And, please let them know I will always love them. “As I grow older, and as my parents grow older, do You see me being the son I should be? Do I reach out to them often and comfort them? Have I shown gratitude for all they have done for me? Help me be a better son, Lord. “As a sibling, what do You see? The years and the miles have made it easy to gradually slip away from my brother, sisters, and in-laws. Do they know how much I still love and care about them? Have I made the effort to let them know? Please help me find a way to do better at staying in touch. I love my hour of Adoration with Him! Lord Jesus, every week when I pray to You before Mass, I ask for insight and Your assistance in helping me become a better disciple, husband, father, son, brother and friend. I pray I never stop asking. Amen. ©2015 Reflections of a Lay Catholic. Reposting and sharing of material in its full and original content is permitted, provided that full and clear credit is given to the author(s) and Reflections of a Lay Catholic. I’m a sinner. We all are in our own way and to our own degree. It’s our nature. It’s called concupiscence. It seems no matter how hard I try I can’t not sin. Oh, I can go for three or four straight weeks and only commit a few minor venial sins (or so I think), but inevitably, through my own conscious free will, I cave in to temptation or an old habit that hasn’t yet been completely unlearned; or I act rashly in a disrespectful or uncharitable manner which I immediately regret. It tears me up – mostly because I know what I did was wrong and, also, partly because it injures the pride I’ve built up for having worked hard to improve and sin less as time has passed. When I do this I know that waiting until Sunday morning mass and asking for forgiveness during the Penitential Act just isn’t going to cut it. No, there’s only one thing I can do to get right with God – make a trip to Reconciliation on Saturday afternoon and humbly lay it on the line to Him. The guilt and shame weighs heavily enough on my conscience that I know it’s pointless for me to try to talk my way out of it. It seems to me that my most serious falls from grace occur early in the week, on Monday or Tuesday. When that happens I have the rest of the week until Saturday to contemplate and painfully stew on the thing(s) I wish I hadn’t done. Why can’t I commit all my more serious sins on Friday night or Saturday morning? Sometimes during those several days between sin and forgiveness I find myself creating elaborate excuses for why I did the misdeed. But, eventually, I always get to, and spend sufficient time at, the appropriate level of contriteness needed for my confession. This, I think, is one of the beautiful things about the Catholic Church. The Sacrament of Reconciliation is such a great gift. Confessing my transgressions to God while I’m physically looking into the eyes of a real person, forces me to be honest with myself, the priest, and especially with Him. If I couldn’t do that I’m sure I would fall victim to my own inventions, justifying that the onus for my actions belongs elsewhere instead of solely with me. When I do visit the priest and confess my sins to God with a truly contrite heart, and promise to not sin in that way again, I am often surprised at the lenient penance given to me. I usually feel as though I deserve less mercy and I’m always grateful for the mercy I do receive. But, then, sometimes I believe that those few days during which I agonized over my sin until I could get to confession may have served as partial penance. At least I hope so. Last week as I waited for Saturday to roll around, I made my usual Holy Hour of Adoration on Friday afternoon. The convenience of this dawned on me: it is the perfect, last chance opportunity to thoroughly examine my conscience, shed the excuses and take full ownership for my actions. After all, it would be just a little difficult, if not foolish, to not get it right while I’m kneeling in front of the Tabernacle looking up at Jesus, and Him looking down upon me. What can I say? I can’t make this stuff up. He knows what I need to hear! This was just another one of those God-moments I’ve come to expect while I’m at Adoration. I looked at the Tabernacle and thought what a great and merciful Lord we have. All He wants us to do when we are tempted to sin is to look to Him and ask for His help. So simple, but our human nature makes it so difficult to accept His will. And I thought, if this is the way He reveals the truth to me, then, if I’m going to sin, maybe it’s not such a bad thing after all to do so early in the week! In the Gospel of Luke 1:15-16, the angel Gabriel announces to Zechariah that he and his wife, Elizabeth, will have a son who will “be great in the sight of the Lord….He will be filled with the holy Spirit even from his mother’s womb, and he will turn many of the children of Israel to the Lord their God.” But, because of their age, Zechariah doubts this message from God and the angel strikes him dumb until the day his son is born. (Luke 1:20). Yesterday’s gospel reading (Luke 1:57-66) recounts how, shortly after the boy is born and the house is filled with guests, Zechariah “asked for a tablet and wrote ’John is his name’, and all were amazed. Immediately his mouth was opened, his tongue freed, and he spoke blessing God.” (Luke 1:63-64). Then, in today’s gospel reading, The Canticle of Zechariah, (Luke 1:67-79), Zechariah prophesies that a mighty Savior has been born, and that his own son, John, will be, “called the prophet of the Most High”, and will, “go before the Lord to prepare His way” (Luke 1:76). I can’t help but believe, that during those nine months when Elizabeth carried John, Zechariah kicked himself a few times for his lack of faith. Not being able to talk must have been a burden. But, it gave him a lot of time to think about the angel’s message. And, most importantly, it created the perfect opportunity for Zechariah to listen to the voice of God, uninterrupted by his own speaking, which ultimately allowed him to utter his prophesy. I don’t think I want to be struck dumb like Zechariah, but I know it would do me good to spend a little more quiet time with the Lord, to turn off my own voice and begin listening to Him to understand His message for me. Because I am traveling, I will miss my normal hour of Eucharistic Adoration this week. I need to build a substitute into my schedule. 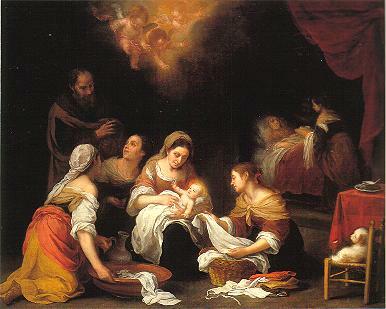 Heavenly Father, on this eve of the birth of Your Son, help me to stop and spend at least a few minutes recounting the preparations I’ve made during Advent so that tomorrow will find me rejoicing like the shepherds coming down from the hills into Bethlehem. Amen. ©2014 Reflections of a Lay Catholic. Reposting and sharing of material in its full and original content is permitted, provided that full and clear credit is given to the author(s) and Reflections of a Lay Catholic. I came to see You today. 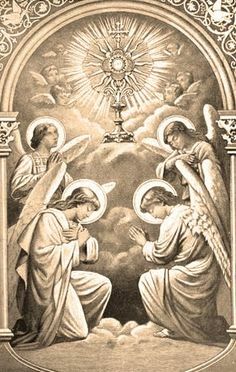 As I knelt in front of You during my weekly holy hour of Adoration I looked up to You in the monstrance atop the tabernacle and I felt You descend and put Your arm around me. You knew my heart was heavy. You asked me what was weighing me down. My answer to You surprised even me. It wasn’t a request to have You take care of and hold close to You my two daughters and the grandbabies they are carrying in their wombs. I didn’t ask You to heal another loved one who is experiencing some unexplained health problems. Nor did I ask You to watch after my youngest daughter as she prepares to leave home and go to college later this week. No, those prayers came later. 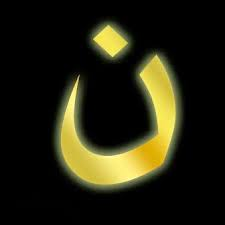 I didn’t know why but I felt compelled to pray for and ask for Your blessings on the thousands of Christians about whom I have read are being persecuted in Syria, Iraq and elsewhere in the Middle East because they believe in You. Lord Jesus, I pray for Your blessings on those men, women and children who are being “persecuted for righteousness sake” and that You open up “the Kingdom of Heaven” (Matthew 5:10) to them as they profess their faith in You even under the threat of death. Please protect them, Lord, and give them the strength and courage to do Your will. I confess to You I didn’t want to, but I did summon up the will to pray for the enemy, ISIS, as You commanded, “But I say to you, love your enemies, and pray for those who persecute you” (Matthew 5:44, NAB). That’s a tough one. I don’t feel loving towards them for even a second but I do wish them love and peace in their hearts. I think that’s what You mean. Tonight at home, I read something in a Catholic publication and I suddenly understood why You made this prayer first and foremost in my heart and on my mind. Today, 1 August 2014, was declared by the Priestly Fraternity of St. Peter to be a worldwide day of Adoration and prayer for the persecuted Christians of Syria, Iraq and the Middle East. I didn’t know this when I was with You. There is truly something special about a holy hour of Adoration! There are simply too many of my prayers answered and mysteries explained to me for the Holy Spirit not to be working during that precious hour of genuflection when it’s just me and Jesus. I’ve written about many instances where I have been graced with understanding during that weekly event, and I now have one more “God moment” to add to the list. In my last post, Never Stop Learning, I recounted how I would pray for God to fill my heart with the Holy Spirit when I started to feel a little empty and I needed to be jazzed up. Then, through a serendipitous reading of Romans 5:5 during my holy hour of Adoration, I came to understand that the gift of God’s love had already been poured into my heart through the Holy Spirit at my baptism and that His love for me is constant and never-ending. Also, through that discovery, I began to make sense of why I sometimes feel exhilarated in my spiritual life and why sometimes I feel less so. But, even though I know I can’t sustain the spiritual rush that goes along with “being in love with the ‘feeling’”, I still pondered how to find a more consistent, day-in/day-out feeling of “being in love with Jesus”. I needed to figure out how to level the bumps in the road. 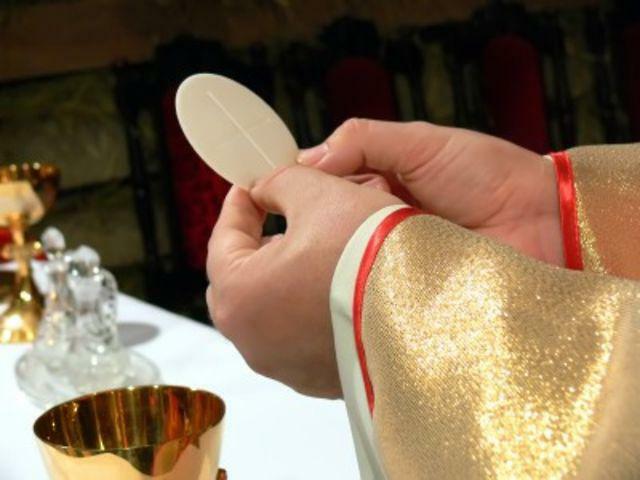 “Whoever eats my flesh and drinks my blood remains in me and I in him.” There it was – the answer for which I had prayed just two minutes before. My mind jumped back a year to the night I became Catholic and I remembered my baptism, my first Communion and Confirmation. I remembered how the best part was feeling the presence of Christ upon receiving His precious body and blood during first Communion. And, I knew that all I needed to do to level those bumps in the road was to be renewed in Him each week through taking of the Eucharist, and to remember that He is in me and I in him – that His love is constant and never ending. I get it. And, I won’t forget it. This week, as I’ve approached those bumps in the road, I have had to stop several times, whisper His name, and remember that He is in me. Each time I have been graced with instant peace. My next holy hour of Adoration is tomorrow afternoon. I can’t wait to discover what new insights I will receive through listening to His comforting words. If you haven’t experienced this grace that comes from spending an hour in His presence, I encourage you to give it a try. Lord Jesus, Your presence, through receiving Your precious body and blood in the Eucharist, nourishes and sustains me daily and brings me everlasting life. May I always allow you to satisfy my spiritual appetite. You are the Bread of Life. It’s been a while since I posted anything about prayer and I think it’s about time to bring the subject up again. I’ve been praying a lot lately for guidance and strength to get me through some difficult tasks, and for the health and well being of some people I know. Tonight, I’m particularly looking forward to 6:00 p.m. tomorrow when I go to church for my hour of Eucharistic Adoration, that special one hour of the week when it’s just me and Jesus. I tend to do my best praying when I’m in church and the best time to do that, I’ve found, is during that one hour a week I set aside to pray in front of the tabernacle during Eucharistic Adoration. I look forward to the quiet time and the feeling that I am in His presence. I mentioned in an older post that I was still getting used to praying. I still am today. I tend to ramble. I need to be more succinct so I can fit it all in when I only have a short amount of time. I have found, though, that my time in prayer is tremendously more satisfying with less pressure on myself to get it all just right when I schedule a full hour in Eucharistic Adoration once a week and take my time. For me, tomorrow is not just any night of Eucharistic Adoration. It’s Adoration with the Blessed Sacrament exposed, which, in my opinion, is the most profound and satisfying way to pray. Exposition is when the Blessed Sacrament is removed from the tabernacle and exposed for Adoration in a monstrance, a sculpture with a glass enclosure that reveals the Host. When I pray during Adoration, whether it is when the Host is exposed or not (reposed), I genuflect for most of that hour. What is significant about an hour, you ask? Well, that comes from when Jesus, after agonizing in the Garden of Gethsemane, finds his disciples asleep. Upon waking them, He asks Peter, “So you could not keep watch with me for one hour?” – Matthew 26:40. Most adults I know are married, have a significant other, and/or have children. Imagine the sadness we would have if we couldn’t spend at least one hour a week with them, the ones we love more than any others on earth. Then, imagine the ridiculousness of accepting that it would be okay to not schedule at least one hour a week to devote to the one’s you love the most. Now convey that thought over to our relationship with Christ. Can we not spend one hour per week getting to know Him better and letting Him help us get to know ourselves better? By doing so, will we not be able to love our families and friends here on earth more fully? Good night, God Bless, and may you find His Grace through your hour of Eucharistic Adoration.